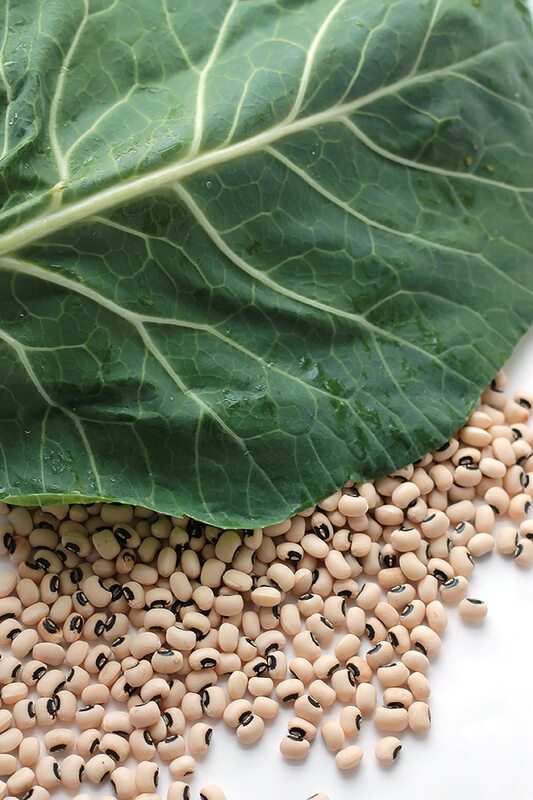 A new take on an old New Year’s Day tradition, Black-Eyed Peas and Collard Soup, slow-cooked perfection. Ready or not here it comes, 2016!!! That means it’s time for my annual black-eyed peas and green, however, this year I’m putting a twist on the traditional black-eyed peas and greens. I’ve put them together on a hearty soup. According to tradition, black-eyed peas represent tiny coins and greens being the color of cash, both symbolize wealth and financial rewards in the new year, and who couldn’t use more of financial rewards. For me it also represents health rewards because collard greens can help lower cholesterol levels and protect against cancer, just be sure not to overcook, which is why I add them at the end of the cooking time. Black-eyed peas are high in fiber, potassium, which aids in lowering blood pressure, and they’re a good source of protein. 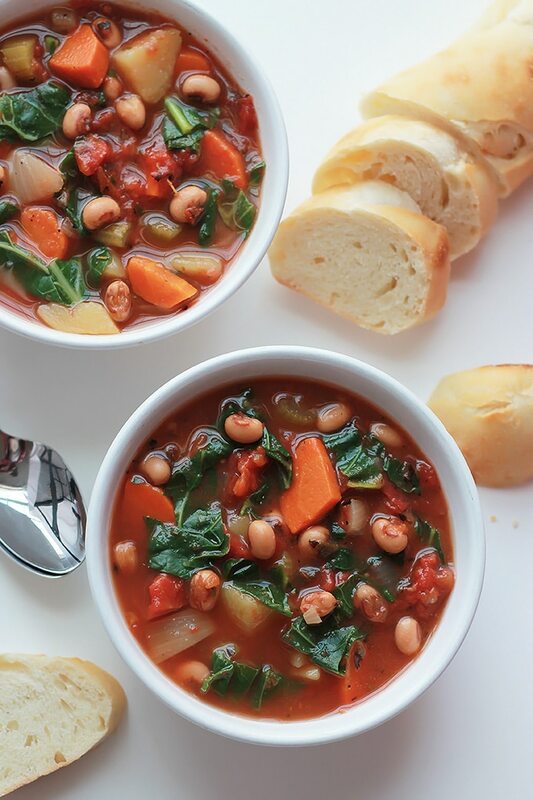 When it’s cold out I crave big bowls of hearty soup so combining the two for this soup just makes sense. Super simple and super easy. Everything goes into the slow cooker, few hours later, soups ready. Perfect for a cold winter day. 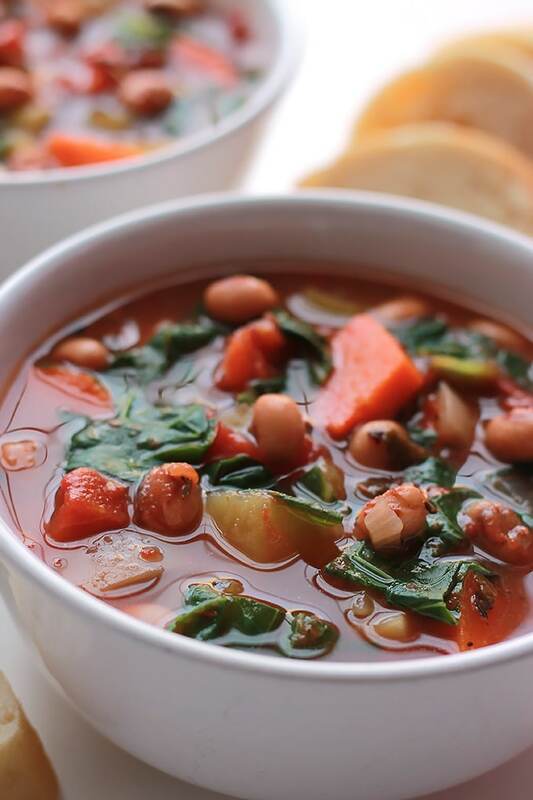 This soup is loaded with fire-roasted tomatoes, celery, carrots, onions, potatoes, black-eyed peas and collards. 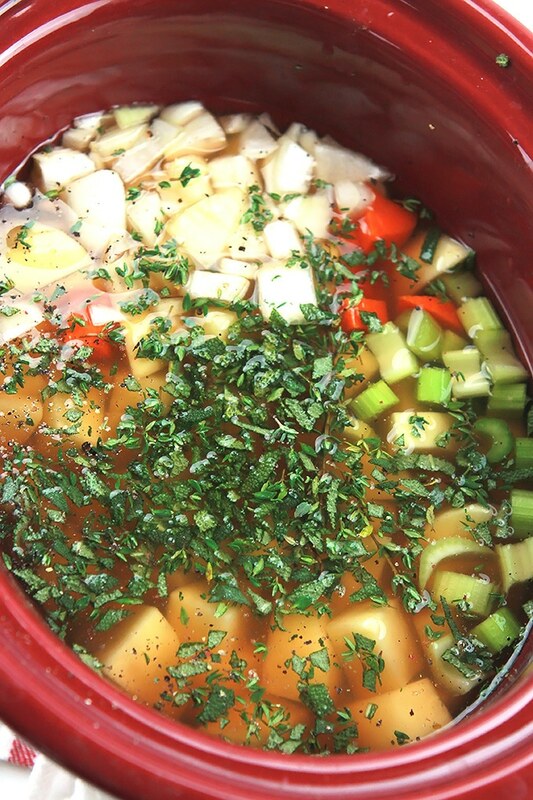 Even if you don’t own a slow-cooker you can still make this soup, just slow cook in a big pot on your stove top. 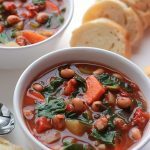 Start your year off right, make this fill-you-up Black-Eyed Pea and Collard soup, cozy up and enjoy. 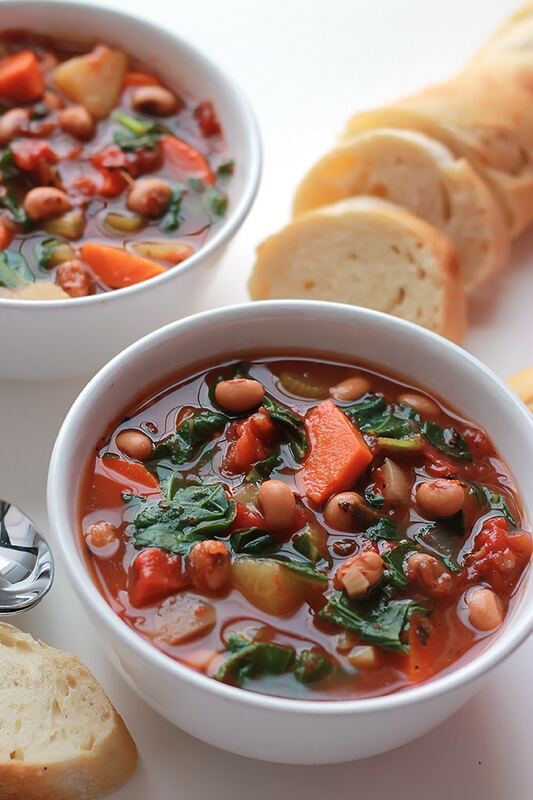 Not soup person?, give this Black-Eyed Pea Chili with Collards a try. Add all ingredients except collards to slow-cooker, stir to combine and cook 3 to 4 hours on high or 6 to 8 on low heat. During the last half hour of cooking time add in the collards and stir to combine. Taste and add more salt and pepper to taste if needed. Serve with bread, have fun and enjoy! What a great way to start the new year!!! My crock pot is on LOW! 🙂 Happy New Year!!! Hi Tonya, Enjoy and have yourself a Happy and Safe New Year!!!! 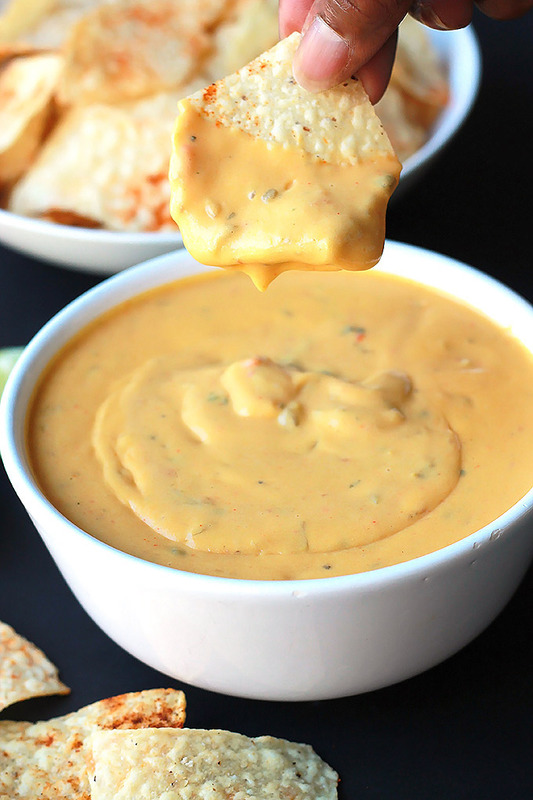 I was immediately drawn to this recipe when I read the title! My mother used to make delicious black-eyed peas, collard greens loaded with smoked pork as well as pig feet and chitlins for New Years Eve. Of course as a vegan I don’t eat that way anymore however I can’t wait to try your healthy and delectable ‘pork free’ soup recipe! I’m pinning and sharing this too! Thanks Deborah, that’s how my mother prepared it minus the chitlins. I hope you enjoy this version as much as me and my family. Happy New Year!!! Growing up in the south we always had Hoppin’John and Collard as well, but it wasn’t my favorite way to eat these foods. As I have aged I have acquired a tate for them in my now vegetarian diet. Thanks Jenna for visiting and thanks for pinning. Yeah, it’s great when you open the door and smell your dinner. I’ve never heard of APS,it’s nice to know you have found something here that can help you manage it. I’m a true believer that food can halp heal our bodies. This looks like a great warming, comfort food. I was interested to read about the traditions and meanings of this soup at New Year. 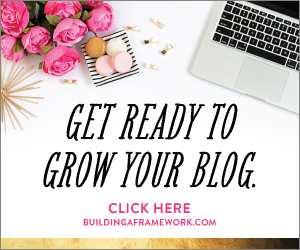 Thanks for sharing with the Blog Fair. Thank you Karen for visiting. I’m glad I found your Blog Fair.